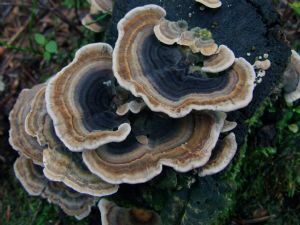 Turkey Tail Mushroom (Coriolus versicolor). A common polypore found throughout the world. The latin name means ‘several colours’. The mushroom’s many colours and shape are similar to those of a wild turkey. We often see this mushroom growing wild on walks in the midlands. T. versicolor contains polysaccharides which is subject to promising ongoing scientific research. Allergy advice: It is always a good idea to try new things in small doses to ensure that it right for you. Some mushrooms can produce allergic reactions.